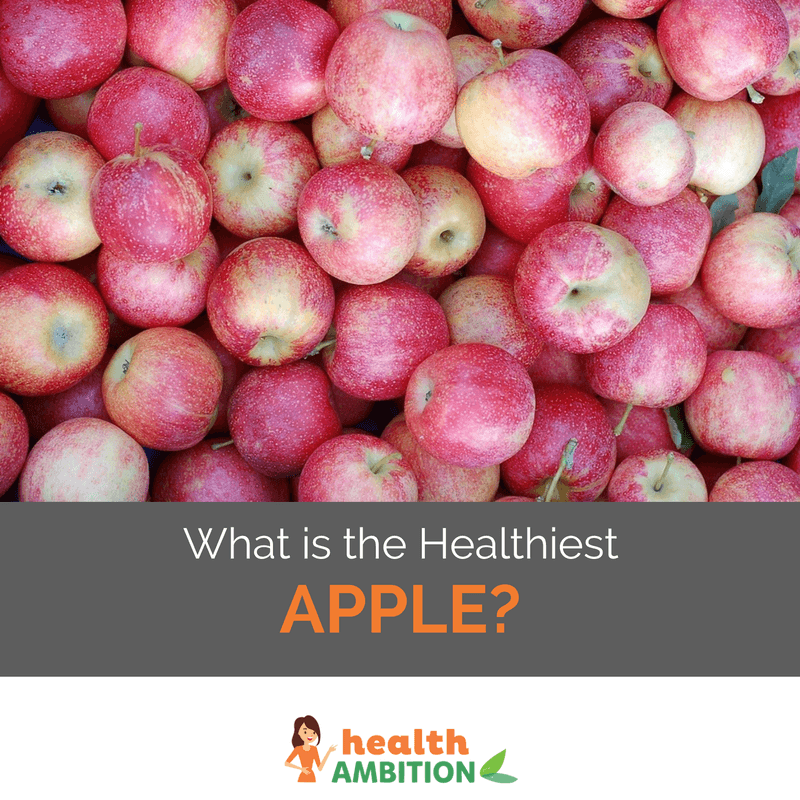 Most people know apples are good for you, but just how healthy are they and is there a healthiest apple in the world? Actually there is. A recent scientific study, conducted at the University of Western Australia, found that the Pink Lady variety had the highest level of antioxidant flavonoids. Accordingly, they have a good claim to the title of the healthiest apple to eat. While other factors, like the soil they are grown in which can affect mineral content, and whether or not they are organic would come into play, flavonoids are definitely a big part of what makes apples so good for you. Here’s why. Flavonoids are a broad term for several different classes of plant-based, water soluble nutritional compounds. They have been studied primarily for their ability to quench free radicals damage within your body that can lead to serious health problems such as heart disease and hasten the visible signs of aging like wrinkles. Essentially, a diet high in antioxidant flavonoids is believed to help prevent and even repair cellular damage and inflammation within your body. This can lead to a lower chance of developing cardiovascular disease, Alzheimer’s, dementia, certain cancers and many other health issues. 1. Quercetin – This flavonoid is associated with reducing inflammation, particularly of the cardiovascular system and improving your immunity. Quercetin has also been used to help reduce allergies and in vitro studies show it slows the growth of some kinds of cancer cells. 2. Myricetin – This is another flavonoid found in apples with anti-cancer properties. Animal studies have demonstrated it has specific actions against colon, pancreatic and skin cancer. It is also thought to inhibit LDL cholesterol oxidization, which is a known risk factor for both strokes and heart attacks. 3. Kaempferol – The powerful antioxidant kaempferol is believed to reduce oxidative damage to our cells and their DNA. Like both quercetin and myricetin, kaempferol is particularly valuable for preventing cardiovascular disease. This flavonoid also has strong anti-inflammatory properties and has been associated with a reduced risk of both skin cancer and pancreatic cancer. 4. Epicatechin – Epicatechin is a polyphenol found in apples that is linked to lower rates of cancer, heart disease and diabetes as well as improved memory. Studies have shown a reduction in fatty deposits and degeneration of arteries with epicatechin supplementation. 5. Chlorogenic acid – As well as having strong antioxidant and anti-inflammatory properties, this phenolic acid can help with weight loss by improving glucose tolerance for less fat-storing excess insulin. Green coffee bean extract is the most potent source of chlorogenic acid, but a daily apple can certainly help. 6. Procyanidin B2 – Unusually, this flavonoid, of which apples are the highest source, appears to have a special effect on your hair and how fast it grows. Procyanidin B2 is said to stimulate hair growth by activating the anagen (growth) phase of the hair follicle and decreasing the time that follicles remain dormant. Scientific studies on these individual antioxidants, while interesting (at least to some strange people like me), don’t really tell the whole story though. It’s almost certain that rather than one or two individual compounds being responsible for the health benefits of apples, it’s the sum total of all the nutrients they contain working together that make them such a potent disease preventing and anti-aging fruit. There is however something many of us are doing to greatly reduce how much the nutritional value we get from our apples. I did it for years but now I’ve found a better way. Why You Shouldn’t Peel Your Apples, or Should You? The majority of the beneficial antioxidants listed above like quercetin, kaempferol and myricetin are found in or just below the skin in apples. Unfortunately many of us peel them, thus removing the most nutrient rich part of the fruit. There’s good reason to do this though as conventionally grown apples are a heavily sprayed crop. They also have wax applied to their skin to shine them up for the supermarket. They might look good but who wants to be eating chemicals with names like thiabendazole, azinphos methyl or carbendazim and waxes often derived from beetle secretions. Whenever you can, buy organic apples that have not been grown with chemical fertilizers and sprayed with toxic pesticides. They probably won’t look as shiny as regular supermarket apples but they’ll be so much better for you. If you can only get conventionally grown apples and would like to try getting any pesticide residue and waxes off them then the following method is believed to greatly reduce chemicals on your produce. To a bowl just big enough to fit your fruit in, add hot water and a good splash of vinegar and let your apples soak in it for at least 30 seconds, a minute or two would be better. Next scrub them thoroughly with a scrubbing brush in the water. Once this is done, rinse them under the tap and they’re good to go. While it’s not guaranteed to remove all pesticides, some resources state that a solution of white vinegar and water will remove 98% of pesticides as well as kill any bacteria on the fruits or vegetables. Here’s an interesting video about the history and nutrition of apples. Apples are a very healthy fruit and it seems we are only just discovering how true the old apple a day saying is. And if you can find the high antioxidant Pink Lady variety grown organically, they may just be one of the most nutritious fruits you’ll eat for a long while. How do you like to eat your apples? Skin on or peeled, washed or straight from the fruit bowl? I’d also be really interested to hear what’s your favorite type of apple. I’ve always gone for organic Red Delicious, but after researching this page, I’ll be looking out for those Pink Ladies at the real food stores. Pink Lady are the only other ones I really like other than Fuji! Good to know they contain so many health benefits as well! I agree on the Fuji apples and like organic Red Delicious when I can find them too. as mentioned above apple has a chlorogenic acid,,is it advisable to eat by person like me with a stomach problem ( gastro reflux) since it is acid base? and sometimes apple taste sour like oranges which is not advisable to eat for those with hyper acidity…before i drink apple juice those u can buy in the market..is it good for my case?? Apples are considered an alkaline food and should not aggravate acid reflux. In fact it’s often suggested as part of a diet to help control hyper acidity. The chlorogenic acid is a very small nutritional component and would not have an effect on your stomach. Fresh apples or apples you juice yourself are much better than commercial apple juice from the supermarket though. Processing will change the nutritional properties and a carton of fruit juice may well be acid forming in a way that the fresh fruit is not.